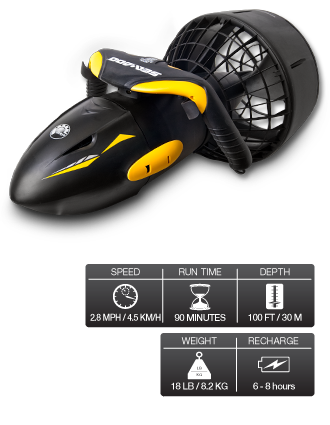 A new performer in a tiny package, the single speed SEA-DOO® SEA SCOOTER GTS delivers thrust for a speed of up to 2.8 mph / 4.5 km/h. The GTS is light enough to carry in one hand making beach dives a reality and snorkeling a dream, and with waterproof circuitry, maintenance is a cinch! Note: This Seascooter is designed for use in seawater. It will have less buoyancy in fresh water, lake or pool and may sink in such waters.